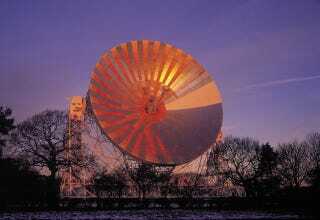 Out in Manchester, a remarkably powerful, 3,200 ton radio telescope has sat atop a field for almost 60 years. But the story of how it got there—and how near it came, even mid-construction, to not being there—is a tale of an incredibly close scientific call. Bernard Lovell had big plans to use his experience reading radar during World War I for a more peaceable enterprise: the construction of a giant radio telescope. The construction was fraught with problems from the beginning, the biggest one, though, was combination of both a scientific and a construction change. By 1951, work had already begun, when hydrogen atoms were detected in the Milky Way, meaning that scientists would suddenly want to be able to look at much shorter wavelengths. Using this—at the time brand new—scientific finding, Lovell halted the workers and re-designed the telescope that they would be constructing on the spot. Just how well the redesign had worked though didn’t really become apparent a few years later in 1957, the year when Sputnik was launched. Though other telescopes tried, the Lovell Telescope (yep, they eventually named it after him) was the only one that managed to successfully pick up the satellite over its radar.